Allen Dronsfield is Inducted Into the FSA Hall of Fame. 2019 01 14. WOW…. WOW… what have I gotten myself into !! Look at all of this , all the champions of shuffleboard and all of you champions of life in general. I am looking at years of struggles and years of dreams, but most of all I am looking at great friends and companions. As I stand before you I am humbled that you allow me to stand among you. I ask , Can I measure up to the examples you have set forth with all of your fine qualities and abilities. In reflection I question myself on my preparation for this task. You see to me my nominee “is just Allan Dronsfield” Just one of the guys who I may get together with for a quick game on a Saturday or a Sunday. I have a hard time fathoming that it was just a few short years ago that I was warning some of the top players, Earl Ball specifically, to be on the alert of a new amateur arising from an area called the “Northern District”: Remember that Earl ….. (pointing to Earl). To me it was Just Allan Dronsfield! But I had recognized something very special. Yes, he had the athletic skills along with an almost natural and flawless shot but more than that he had the determination, devotion, focus and yes he even had the “Eye of the Tiger” to be the best. To me it was Just Allan Dronsfield ! but I knew he was destined to be much much more. It amazes me how quickly Allan arose from that relatively unknown amateur from the Northern District to a rising star who is now known by all of FSA. I need not warn anyone any longer as no one is happy to draw Allan in the quarters. His statistics are numerous and he has set many records. If I were to recite them all we would be here far to long and I would bore you to death. Just the fact that he is the reigning Masters champion for two years consecutively sets him apart. I was taken aback, when I asked a question of another great champion and a true legend of Shuffleboard. Because to me “it was just Allan Dronsfield” I asked “Mike Vassalotti”, who was Allan’s Partner right here in Clearwater, this question. “Mike what do you think of our new rising star, I think he will be the next Chuck Stansburge Mike , what do you think?” His reply shocked me as he said this. Most of you have not had the opportunity to get to know Allen like I have. You get to see him when he is supercharged and motivated to win a match or a tournament. I have experienced Allan’s deeper soul in off the court environments. As an example of Allan’s true character, he an I were in the middle of one of our bad times. I had been very hard on him and we had not talked for weeks and weeks. He returned from a cruise vacation and learned the I was in need of a friend. Without hesitation he came to me and said. “Dennis we need to put this behind us and move on because I believe in you and wish to help”. Now that is the Allan Dronsfield I know, Thank you Allan!! Don’t forget Allan “Sunday” you and me court 13 Hawthorne. I could go on for a long time but I think I will leave it as is. 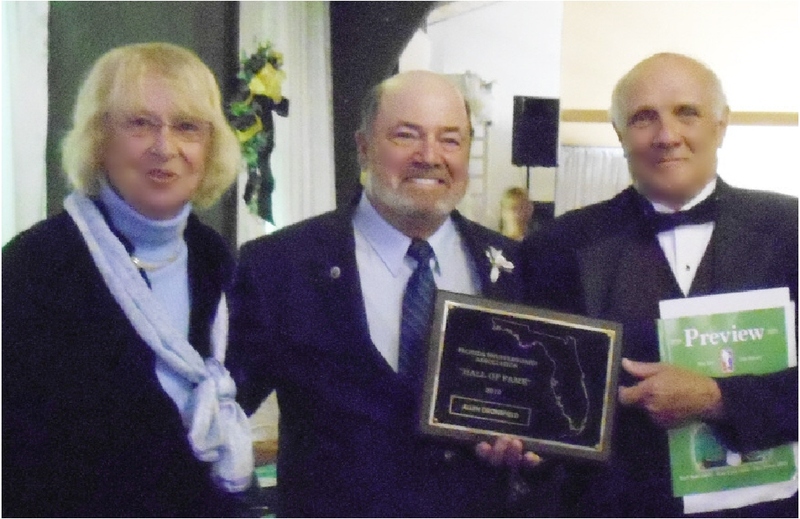 So therefore it is with my great pleasure and great honor to present you Allan Dronsfield, with this award and inducting you into the FLORIDA SHUFFLEBOARD ASSOCIATION’S HALL OF FAME” Congratulations Allan Dronsfield. Presenter Dennis Abbenante. 2019 01 14. I am really pleased to be entering the FSA Hall of Fame. And certainly, in very good company. This achievement has come very quickly but not without a lot of hard work, fine partners as well as the opponents I have faced. They may be more responsible than most; they brought the best out of me. I have tried hard to be a worthy recipient of this honor. I’ve had a few bumps along the road but haven’t we all. Granted, all the victories, the back to back FSA Master’s and the State Single’s title were fantastic. However; there are two things which I cherish the most and that was putting together the All Amateur Tournament a few years back. Everyone had a great time and requested we do it again. Secondly my Sunday clinics are very special to me as I watch many of them excel and come into their own because of the clinics. I am not sure what’s next for me; I am sure that a limited schedule is in order as I still have many interests outside shuffleboard. I suppose for me, it is really not all the hardware we receive from winning, the trophies, plaques, etc. as much as it is the congratulations from our peers that means the most. Whatever comes next, I would want all to know I am very respectful and appreciative for the many that support me.